I mentioned here that I liked the simple, visual way the Lone Wolf books presented the weapons available to your character. Here is my attempt at that. Wish I had better images for some of the weapons. Don't know if I'll have time to make a missile weapon one before the session tonight. Get the pdf here. Now I can just put this in front of players when they need to pick a weapon. Blunts are together. The three longest require two hands: pretty easy to explain I think. Okay, I got to get to work. Love it. One of the things I liked best about the Unearthed Arcana was the reference pages near the end that had illos fo all the strange pole-arms. Nice. Exactly what I want to do in PARS FORTUNA, putting the relevant information beside each weapon, and maybe giving two or three different versions of each weapon to spark the imagination. The original dragon warriors book did exactly this in the 80's. I believe it is still on the underdogs site. Might be worth a look. Where did you get this wonderful art? Please tell me it is somewhere public domain, I am so going to rip it! Very good idea. 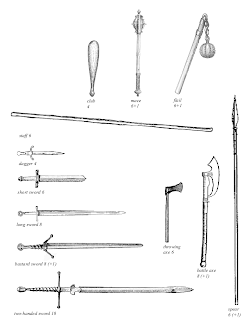 I too loved the Unearthed Arcana images, who knew what all those strange sounding weapons were?!? Man, where is my Bohemian Ear-Spoon at? Great depiction of the "basic" weapons though. I'm guessing (+1) is the bonus for two handed wielding? 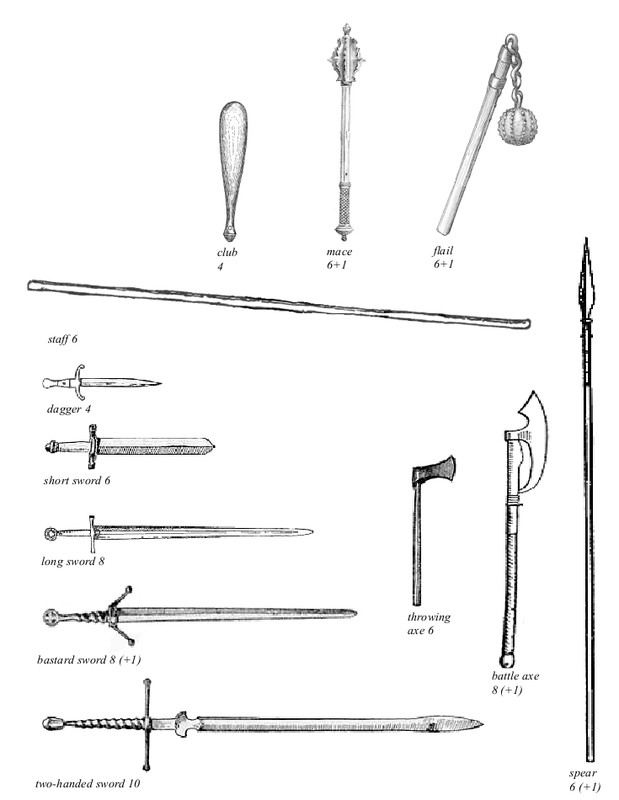 Thanks all, these are public domain , almost all from different sources (although mace an flail I posted earlier). Yeah, this: (+1) means two-handed use. And yes, I had no idea what a bohemian ear-spoon was for years. Remember before the net, how you'd have to go to the library and then be lucky enough to score a detailed weapon book that would mention something so obscure? We've got it easier now.